Fabufacture welcome’s all international orders. We have shipped our products all over the world – even as far as Australia! Step 1 – Add your items to your basket as normal. 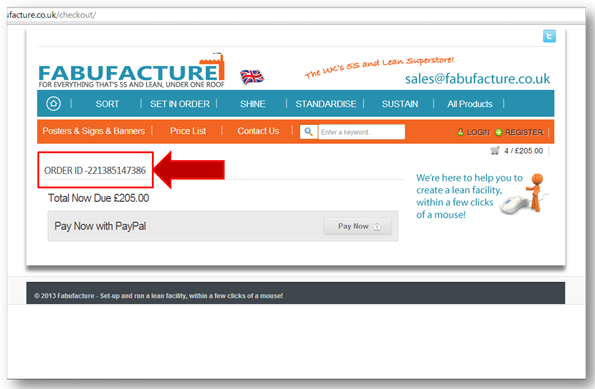 Step 2 – Follow the checkout process, filling in your delivery address details and continuing through the payment steps, until you get to the page that displays your ORDER ID (see image below). Step 3 – Make a note of your ORDER ID (DO NOT PRESS ‘Pay Now’ – just come back to this page) and fill in the International Order Form below. We will then contact you with a total order price quote.